Russia have all but secured their passage into the World Cup round of 16 with yet another resounding victory in Group A. The hosts fended off Egypt's challenge with a 3-1 win at the Zenit Arena. 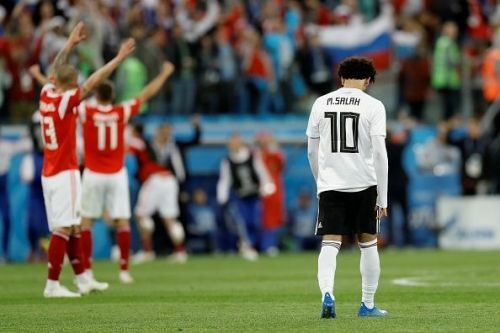 Despite Mohamed Salah's return to the starting eleven, Egypt could not withstand Russia's attacking pressure and succumbed to consecutive defeats. Golovin and company opened the scoring in the most bizarre of ways as Ahmed Fathi mistimed his clearance effort and hit the back of his own net. Cheryshev doubled Russia's lead with a neat finish, while Dzyuba made it three with his show of strength. Salah scored the consolation goal for Egypt but it proved to be too little too late to mount a comeback. There's a lot to discuss from this game which has almost given us our first knockout participant. So without further ado, let's analyze Russia's 3-1 win in further detail with the help of 5 key talking points. Egypt needed a strong start to have any chance of toppling the hosts. But the exact opposite happened as the entire Egyptian back line looked nervous from the word go and committed unnecessary mistakes. In the first 15 minutes, Russia had a high number of chances due to Egypt's loss of possession in a dangerous position. Though the Pharaohs gathered themselves around for the remainder of the first half, the defensive lapses continued in the second interval. 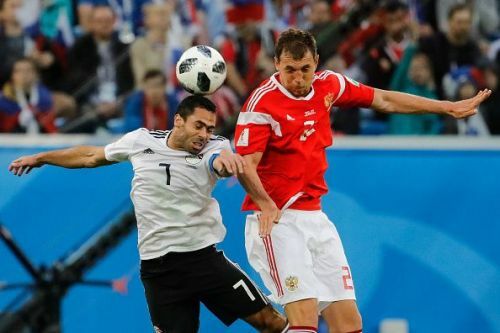 Mohamed El Shenawi's unnecessary punch gave the ball to Aleksandr Golovin whose shot was untimely cleared by Fathi to score an embarrassing own goal. The second Russian goal came through some brilliant play from Mario Fernandes. But for the third, Russia went route one and hoofed a long ball onto the towering Artem Dzyuba. Ahmed Hegazi lost the aerial duel against him, and the striker then beat another defender to score his second of the tournament. Better composure was expected from the Egyptian centre-backs against Dzyuba.